Tomorrow you’ll be turning two! Two whole years! It’s crazy. Hasn’t time flown. Time is a funny thing. In some ways your birth feels as if it were yesterday and in other ways it feels like many many years ago, almost like a dream. 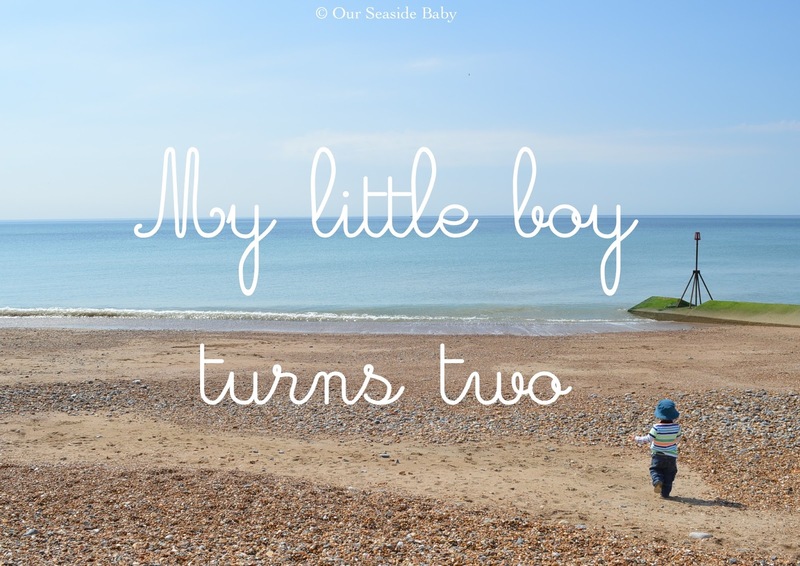 Sometimes it is still hard to believe that you are my son and that you’re nearly two! You do something new every single day and it still amazes me what a clever little cheeky monkey you are. You love running, the sea, animals, Thomas the tank engine books, pushchairs, taking everything out of the cupboards, throwing your food on the floor, sorting and rearranging, music, dancing, nursery rhymes, singing, people singing to you, saying ‘oh no’ in a posh grown up accent, your wind up toy fly, toy cars, aeroplanes and helicopters, animals, jumping on the beds, imaginative play, painting, being tickled, laughing, going into all of the places you’re not allowed in, and your favourite food is still strawberries. Your daddy has been taking you on the trampolines a lot recently so you now think beds are trampolines too which is why you have been bouncing up and down in your cot a lot! Your dancing has also turned into a jumping bouncing sequence. In the last month you have started saying so many more words. You can’t speak in proper sentences, usually it’s two words together but it’s amazing that I can have a conversation with you at the moment (subjects must relate to food, animals, toys or activities). This week, for example, I have been telling you we are going to the zoo for your birthday and ask you what animals we’re going to see. You give me a big list of animals we’ll see which usually goes in the order of cow, cat, dog, bird, monkey…etc. If I ask you what you want to do in the morning your list usually includes the sea, going on a train or a trip to the park! Physically you’re still very big for your age! Your hair has still never been cut (although it’s coming soon I think) and you have beautiful cute curls. Your hair is a beautiful shade of light brown with some golden streaks. You have blue/green eyes and a beautiful smile. You love pulling funny faces especially your surprised face and your over the top smile. You still have a chubby little baby face which means I just want to kiss you most of the time! You are such an affectionate little boy. You have given some wonderful cuddles this month, proper arm wrapped big boy cuddles. They make my heart melt. Happy Birthday for tomorrow little boy! It is bittersweet because I want you as your little baby self sometimes but then you are at a great age now, full of energy and such a gorgeous little boy. I'm so excited about your birthday tomorrow and think you will love the zoo! I didn’t think it possible but my love for you grows and grows every single day and as always, I love you more than words can describe. this is such a lovely post! I hope that you both enjoyed his birthday. This is going to be such a great post for you to go back and read. All the little snapshots of who he is right now.